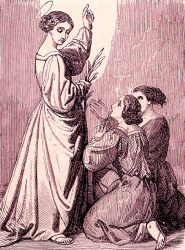 St. Dorothy was a young virgin, celebrated at Cæsarea, where she lived, for her angelic virtue. Her parents seem to have been martyred before her in the Diocletian persecution, and when the Governor Sapricius came to Cæsarea he called her before him, and sent this child of martyrs to the home where they were waiting for her. She was stretched upon the rack, and offered marriage if she would consent to sacrifice, or death if she refused. She was then placed in charge of two women who had fallen away from the faith, in the hope that they might pervert her; but the fire of her own heart rekindled the flame in theirs, and led them back to Christ. When she was set once more on the rack, Sapricius himself was amazed at the heavenly look she wore, and asked her the cause of her joy. Her joy grew as she was buffeted in the face and her sides burned with plates of red-hot iron. The Saint promised to grant his request, and, just before she died, a little child stood by her side bearing three apples and three roses. She bade him take them to Theophilus and tell him this was the present which he sought from the garden of her Spouse. St. Dorothy had gone to heaven, and Theophilus was still making merry over his challenge to the Saint when the child entered his room. He saw that the child was an angel in disguise, and the fruit and flowers of no earthly growth. He was converted to the faith, and then shared in the martyrdom of St. Dorothy. 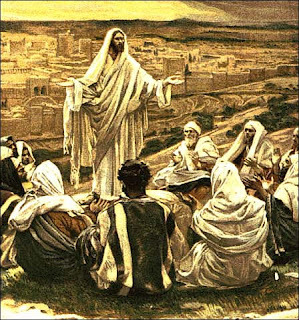 “Jesus summoned the Twelve and began to send them out two by two and gave them authority over unclean spirits. They drove out many demons, and they anointed with oil many who were sick and cured them.” -Mark 6:7-13.